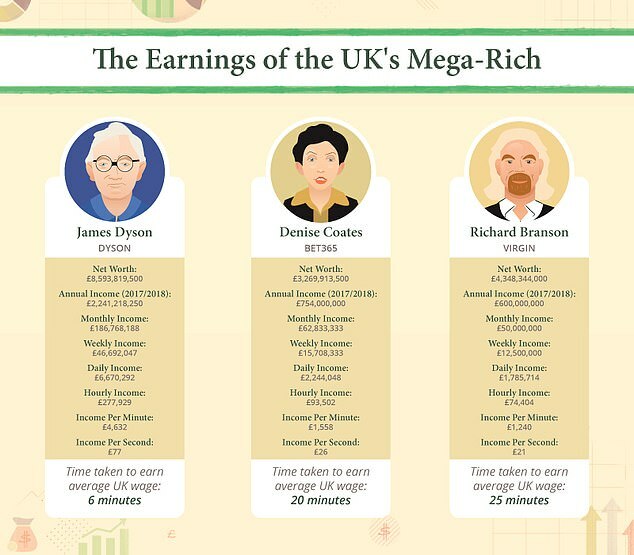 Amazon founder Jeff Bezos earns more in 28 seconds than the average Briton is paid in an entire year and today you can see how your pay packet compares to the world's richest billionaires. Facebook boss Mark Zuckerberg needs just a minute to take home the £28,600 average UK salary while Bet365 mogul Denise Coates must only wait 20 minutes to bank the five-figure sum. British inventor James Dyson, who is worth £8.5billion, earns £77 per second and secures the typical UK annual wage in less than six minutes. The growing gap between the world's richest people and workers is revealed in new research published today. And ABC Finance's 'you versus the mega-rich' infographic reveals exactly how much you earn compared to billionaires in America and Britain. There are 2,000 billionaires across the world with a combined wealth of almost £7trillion. Amazon's Jeff Bezos tops the list with a mind-boggling £620,000 ($785,000) earned every week. 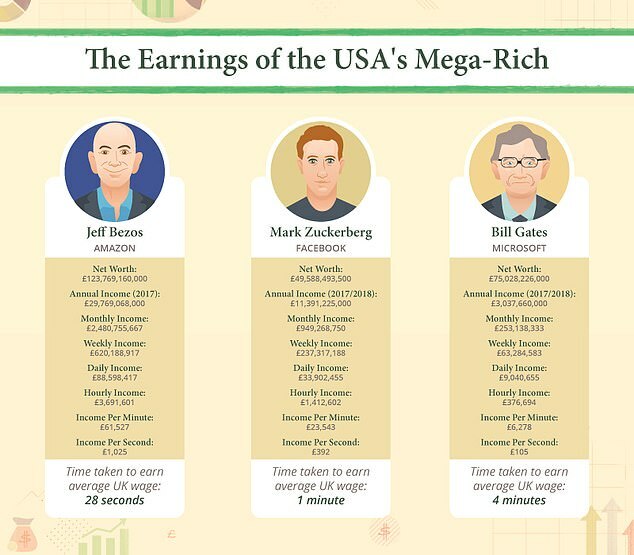 Mark Zuckerberg needs a minute to earn £28,600 ($36,000) while Bill Gates requires just four minutes to earn that amount. There are now 54 UK-based billionaires with an astonishing combined wealth of more than £123 billion ($156bn). James Dyson, who is worth £8.5billion, earns £77 per second and pockets the average UK wage in six minutes. Bet365 mogul Denise Coates, who is worth £3 billion alone, and she, her father Peter and brother John needed 20 minutes to bank £28,600 because they were paid £754 million last year. 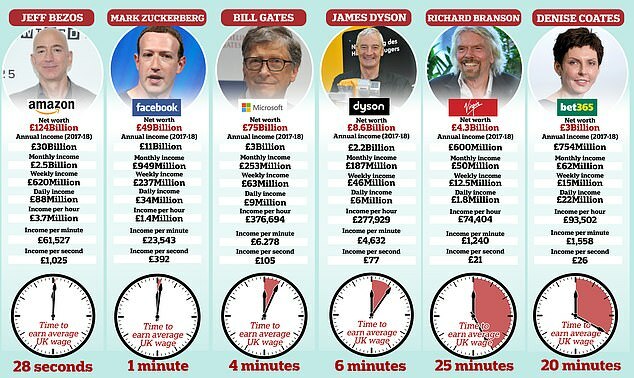 Virgin boss Richard Branson, who is worth more than £4billion, takes only 25 minutes to earn the UK average wage. 'As recent studies have shown, the richest 1 per cent now own half of the world’s total wealth – allowing them to maintain lifestyles most of us can only dream of', according to infographic and in-depth feature from the ABC blog. A spokesman added: 'We love to compare ourselves to others, and this is especially true when those other happen to be ludicrously rich'. Their research also reveals which continents have the most billionaires. 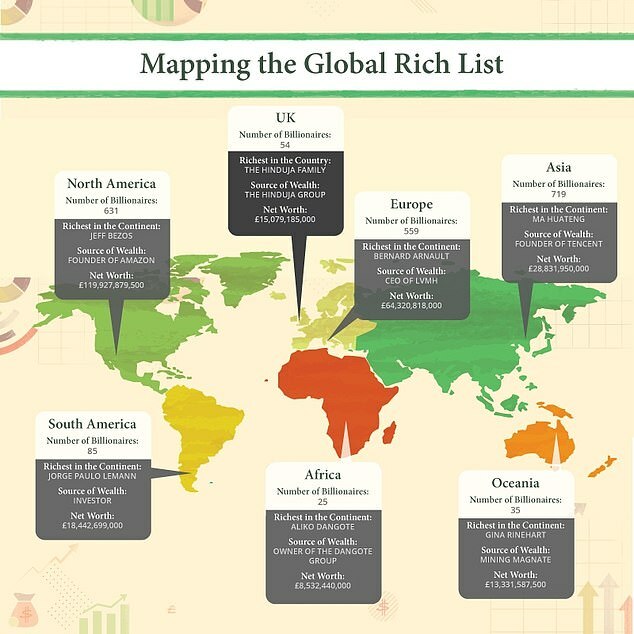 Asia has the highest number with 719 mega-rich followed by North America which is home to 631 billionaires. Europe is home to 554 billionaires where as Africa is home to just 25. Earlier this year it was revealed the number of billionaires in the world has soared to a record high - and they are richer than ever before. The wealth of the world's billionaires increased by 24 per cent from 2016 - to $9.2 trillion (£6.83 trillion) - and there are now 2,754 of them around the world. The number of female billionaires also increased, rising by 18 per cent year on year, according to the annual Wealth-X Billionaire Census. Wealth-X credited the steep rise in the number of billionaires to 'a vibrant technology sector, as well as dynamic growth in the number of ultra-wealthy individuals in Asia'. Most of the world's billionaires are from the US, with the North American nation accounting for 25 per cent of the global total. The U.S. is also home to seven of the ten richest men in the world - Amazon CEO Jeff Bezos, Microsoft's Bill Gates and Warren Buffett. In 2017, the U.S. added 60 new billionaires, taking the total number to 680, with a combined wealth of $3.2 trillion (£2.37 trillion). The U.S. is followed by the Communist People's Republic of China with 338 billionaires, and Germany with 152 billionaires. India comes in fourth with 104, and Switzerland in fifth with 99 billionaires. The United Kingdom is eight, home to 90 billionaires with a combined total wealth of $251 billion (£186 billion). The 54-year-old entrepreneur founded Amazon, the world's largest online retailer, in 1994. He became the world's richest person last year. The Microsoft founder has been on the Forbes Rich List since 1987, and between 1995 and 2017, he 'won' the top position all but four years. He is also known for his philanthropic work along with his wife Melinda. The American business investor is the CEO of Berkshire Hathaway, which wholly owns companies such as Geico and Dairy Queen and parts of Cocoa Cola, Kraft Heinz and Apple. The 69-year-old is head of LVMH, the world's largest luxury-goods company, which includes Louis Vuitton, Dior, Moët & Chandon champagne and Hennessy cognac. He is the richest person in fashion - and in France. Zuckerberg, 34, launched Facebook along with his college friends while at Harvard University, and is still the CEO of the social media giant. The 82-year-old Spanish business tycoon is founder of the Inditex fashion group, which includes high street favorite Zara. The Mexican business magnate, 78, was the world's richest person from 2010 to 2015. He has made his fortune from buying into Mexican companies, and accounts for 40 per cent of the listings on the Mexican Stock Exchange. The brothers, aged 82 and 78, head up Koch Industries, the second-largest privately held company in the United States. The 73-year-old American co-founded software company Oracle. He is the owner of the sixth largest Hawaiian island and his own racing yacht team.